In all my classes since Labor Day, everyone seems to be so motivated to get back into a cooking and dinner routine! Although, now that I think about it, people that come to a cooking class ARE motivated to cook. So maybe the entire universe isn’t looking for new dinner recipes, but I am. And I am doing my best to be really organized about meals again. I find it a million times easier to make dinners in the summer than during the school year. Sliced tomato, burrata, basil and olive oil counts as a meal in the summer. Not so much now. My family wants “real food!” Of course my days right now are overscheduled and I am still driving around a 16-year-old who could easily have her license by now if she were only motivated to take the test. I was dying to get my driver’s license when I was in high school. Not my daughter. She seems perfectly content to let me and her friends be her personal Uber. Why am I talking about this? Oh right. Because I am driving all over the place in those precious hours before dinner time. So I need to be Uber organized, if you will. 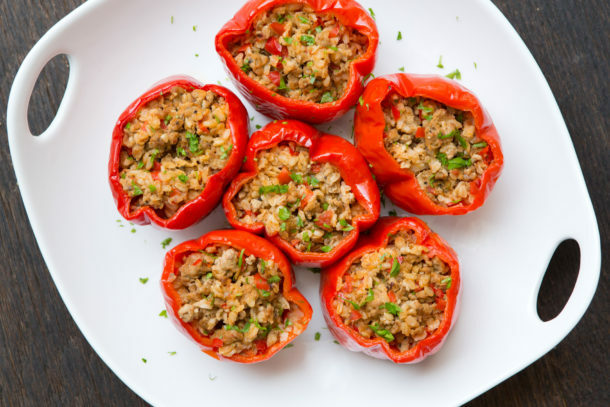 I taught these turkey and brown rice stuffed bell peppers in a class a year or two ago and realized I hadn’t made them in a while. With a salad, green vegetable or some millet-cauliflower mash, this is a great weekday meal for my family. My husband and son feel like they’re getting a substantial “meaty” main dish and I know that there’s more plant-based foods in this recipe than meat, so I’m happy too. 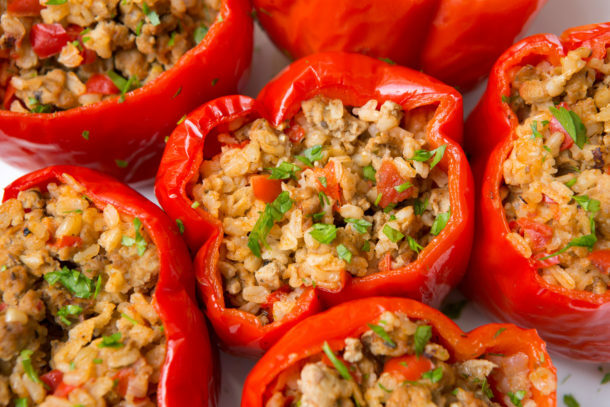 My mom and my grandmother used to make stuffed peppers often, but they used ground beef and I don’t think much rice, if any at all. I love adding a hearty grain like brown rice here to stretch the turkey a little further. I think this recipe has a lot of flavor as it is written, but there’s plenty of room for adaptation here. 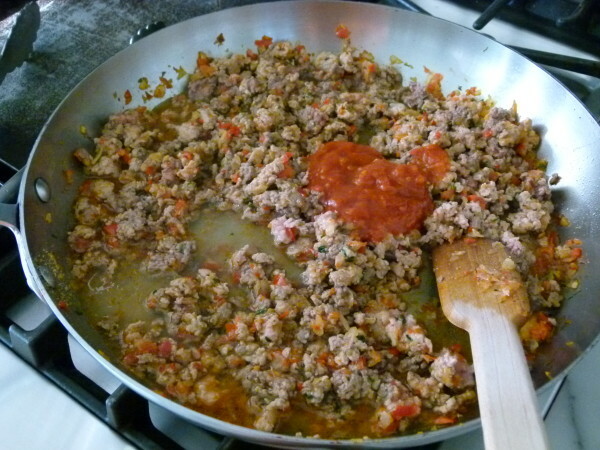 Add basil or switch to cilantro; add some grated cheese to the mixture or on top; add a little turkey sausage; or use grass-fed beef if you prefer. Once I had a half of a small zucchini and I grated it into the onion mixture. Mushrooms also go really well here. One thing I would advise is to seek out pesticide-free or organic bell peppers since they are on the Dirty Dozen produce list. For those of you do-aheaders (like me), stuff the peppers earlier in the day and refrigerate. Then bake when you get home. Or, prepare and bake these after school, and transfer cooked peppers to your slow cooker on the warm setting until you are ready to eat. I am doing this more and more since I have a little time after school to do meal prep and then I’m out with the rest of the taxi drivers until dinner time. Until, I pray, someone decides to get herself into gear and let me stick to my day job. Preheat oven to 400 degrees. 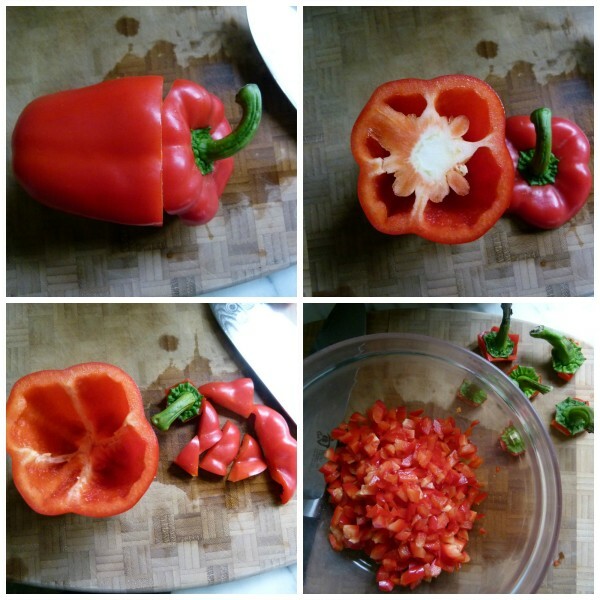 Trim the tops off the bell peppers, just enough to remove the stem. If you want, dice up any pepper that you removed with the stem. Scoop out and discard the seeds. Rub the outside of the peppers with a little olive oil. Place cut side up in a baking dish and bake in the oven for 15-20 minutes. Warm olive oil in a large skillet over medium heat. 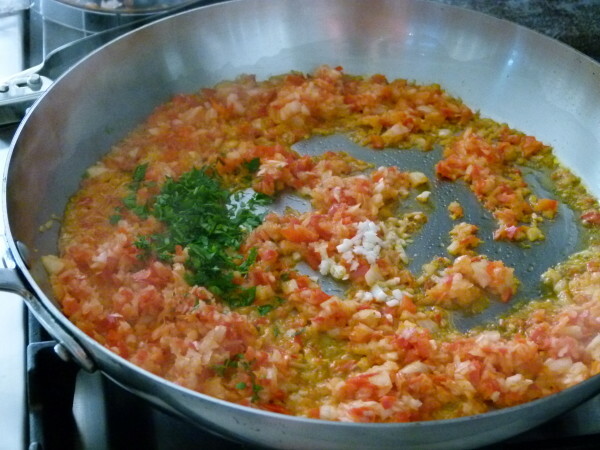 Add onion, garlic and parsley to the pan. 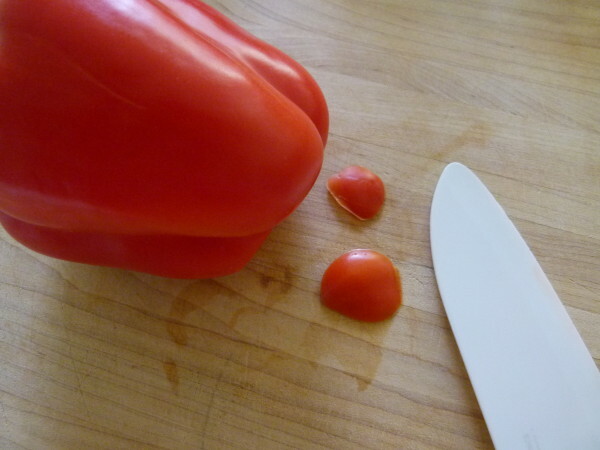 You can also add any pepper bits you may have diced. Sauté about 2 minutes and add ground turkey, garlic powder, oregano, salt and pepper. Break up the turkey into small pieces with a wooden spoon and sauté until turkey is almost cooked through. Add tomato sauce and ½ cup stock. Simmer on low for 5 minutes until just cooked through. 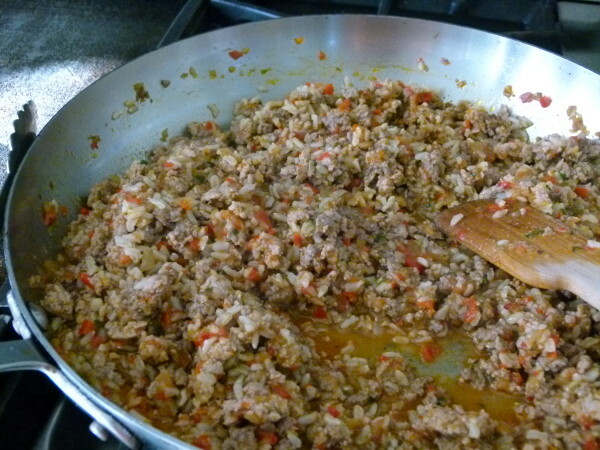 Add cooked rice to turkey mixture and combine well. Spoon turkey mixture into each pepper and fill to the top. 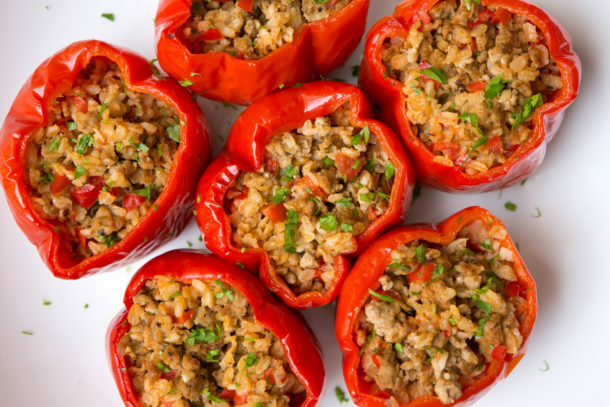 Place the stuffed peppers in the baking dish and add ½ cup stock to the bottom of the pan. Cover with aluminum foil and bake for 35 minutes until peppers are nice and soft and the turkey mixture is heated through. You can add a little shredded mozzarella on top and broil until melted, if you like. DO you think cauliflower rice would work instead of the rice? I am going to guess yes, but I haven’t tried to. Delicious!! Another home run. Thank you. Awesome! Just what I like to hear! Everyone in my family loved it!!!! It was fantastic! Thanks for another great recipe! I just made this tonight and they ALL loved it – even my “mr. picky”! WooHoo!!! This is a winner! Thank you so much! I was looking for a “fancy” healthy dinner to add to the routine and this is a great idea to fit the bill. I am going to try substituting sweet potato hash or cauliflower bits for the rice since I am avoiding grains. Thanks Pamela!